LaCrosse encephalitis virus (LACV) was first described from a fatal human case in LaCrosse, WI in 1964. The natural virus cycle involves woodland mosquitoes, primarily Aedes triseriatus (Say) (Eastern treehole mosquito), and small mammals such as chipmunks and squirrels. Infected Ae. triseriatus females also possess the ability to pass the virus to the next generation through the egg (so called transovarial or vertical transmission). Humans are accidental hosts and usually come into contact with the vector through recreational activities or when mosquito habitat overlaps with human habitations in areas of deciduous forests. Most cases of LACV disease occur in the upper Midwestern and mid-Atlantic and southeastern states (Figure 1). 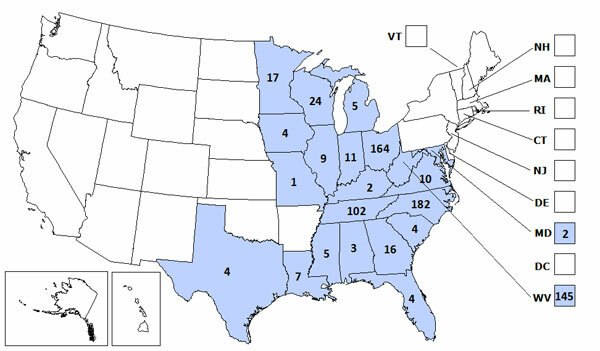 Data table: From 2004 through 2013, La Crosse virus neuroinvasive disease cases have been reported in Alabama (3), Florida (4), Georgia (16), Indiana (11), Illinois (9), Iowa (4), Kentucky (2), Louisiana (7), Maryland (2), Michigan (5), Minnesota (17), Mississippi (5), Missouri (1), North Carolina (182), Ohio (164), South Carolina (4), Tennessee (102), Texas (4), Virginia (10), West Virginia (145) and Wisconsin (24). In laboratory studies, Ae. albopictus was found to be a more efficient vector of LACV than the primary vector, Ae. triseriatus raising the concern that this species, which utilizes similar breeding sites, could ultimately play a role in LACV transmission in the field. Aedes albopictus was found naturally infected with LACV in Tennessee and North Carolina in 1999 and in Texas in 2009. The discovery of vertically infected Ae. albopictus suggests an overwintering mechanism for the virus similar to Ae. triseriatus. Based on these findings, Ae. albopictus seems to possess the necessary attributes to be considered as an emerging vector for LACV. According to CDC, many people infected with LACV have no apparent symptoms. Among those who become ill, initial symptoms include fever, headache, nausea, vomiting, and tiredness. Severe disease occurs most often in children under the age of 16 and can involve encephalitis (an inflammation of the brain), seizures, coma, paralysis and in rare cases, long-term disability or death. There is no vaccine or specific treatment for LACV infection and care is based on symptoms.